and to seed wonderful, perhaps more exotic versions of ourselves as I mentioned earlier, to establish our personal and powerful Source Connection. There are many doorways that can open a strand of connectivity. I've spoken of any number here in previous articles and would be happy to work with any of you individually on this. I feel it is my path in this life to be a guide for any who wish to seek their Heart Path. se heavenly beings we refer to as angels surround us at all times though we are mostly unaware. Always we are able to call them in for guidance, light and protection with a simple prayer: Beautiful angels, I need your help now. And they will be with you in energy, to help. Feel their presence as they stand against your back and cast a light upon your way but don't assume you know the direction you should go. Listen carefully for their whispering for they may point you in a completely new direction. Then say simply, 'I hear and I obey' and do as they have told you. Sometimes this requires you to throw caution to the winds. If you would fly however, you must be ready to leave the solid ground." ..."What do you think about this; how am I to do that" , until you develop a more clear picture and can begin to walk your HeartPath, to grow your new self seeds in your own beautiful Heart Garden. You may also consider doing individual study with me to help you be more clear about your own HeartPath and how to proceed on that. Be sure to reply to this email if you have any questions at all. My intent and my true pleasure really is to be of service to you in any way I am able. Finally, I have Healing art prints available for you to use. They come with information about the individual print as well as detailed information on how to use them to the most advantage. Here in Silence we connect to Guides who teach us, Nu levels of spiritual skills. Beyond the plain life skills of doing a thing. "To awaken those in your life who are asleep, you must dance a new dance, (dress a new dress). They will only awaken when you no longer keep time to their sleeping realities. This may anger them, certainly it will confuse them but this causes them to awaken long enough ( for you) to explain what you are doing. Chances are, they won't hear you. They will just want you to return to your old ways but if you do that, your soul will die and so will theirs. Work with the Water, the Silence, the Witnessing to prepare and receive information that will help you dance that 'New Dance' and awaken those still sleeping"
"Use a larger bowl of glass or metal. Put a clear crystal in it and fill it with room temperature, pure water. Light a candle and set it near there as well. Touch the bowl ( as you consider what information you are seeking). Hold it between your hands. Be in Silence, stillness and just listen, (Feel the vibrations coming thru the water and crystal in the bowl. They may make your fingers tingle.) The bowl/water/crystal will help transmit, information ( for you) to use (in answer to questions you have asked of it). When (your meditation is) completed, finished with transmission, put the water in a jar and (refrigerate to) drink (over the next few days)." The crystal energy will change the water with small charges from the crystal and information that was given to you. Remember water and informational knowing are both energy and interact with one another to create changes in the water's structure and your own as well. When doing the Nu Water Mediation myself, I had asked how to bring about changes in existing situations, and I was given this information as I sat in silence holding the water bowl. I came to understand that in order to manifest changes in any area, the secret of manifesting was, not asking for change, but instead, BECOMING THE CHANGE OURSELVES. "And negative things, can you manifest them as well?" I was told, "Of course. This is the source of much illness and 'bad luck'. What you believe you have comes to you"
Personally I find that my own fears will interfere with my best intentions in this practice but I do practice and hope to grow better. This is such an Old Secret, an open secret to many. Considering this I found myself unhappy with the idea that I was not to express my feelings and desires as it's been quite a journey to be able to step out from behind my acculturation masks and speak up for my own needs. It was not an easy journey but a needed one. I value that ability and we all should, but this goes beyond "asking". While we always need the power to express our feelings, this is about Trust and also Believing that all is one. Being so connected on a star stuff level, we truly do, already have what we wish to manifest but must believe it in order to do so. It's not about wishing and hoping. It's about believing, focusing on the desire ALREADY being fulfilled and the energy that creates. And so we are left with Witnessing and raising our levels of Spiritual Skill, and using the information given to us thru the Sigh-Lens of the Nu Water work or any other form of connection we may practice. In these ways we can evolve a knowing that WE ARE THE CHANGE we seek to manifest and begin to be that. We, ourselves, are already what we desire to create. There is no way of understanding this rationally, just an acceptance that it is the truth. It is a manifestation of Higher Spiritual Skill levels which is not rational. The closest I am able to come to explaining it is to say, we are all called to begin and journey in trust and belief, purified and informed by our Spiritual practices, which move us thru doorways and across bridges to Beyond the Possible. WE ARE THE CHANGES WE SEEK TO CREATE. It becomes real when we are able to witness a situation that has occurred and realize that in that moment, we did something that we might never have considered before, accepted a suggestion we couldn't have conceived of as a possibility, and see that truly, we have committed to a new path without being able to rationally explain it...living beyond what we thought was possible for ourselves. This is a time that is holy to us in many ways, all of them centered in Light and its physical and spiritual presence in our lives. Yet this particular year, events of much darkness have brought us another warning of how important it is for EACH of us to hold the intent and act upon it, of ACTIVELY bringing light to this world. How we do that will be different for each of us depending on our own truth and Iconic Essence. The cards for this reading and two other personal readings, left little doubt in my understanding of how important our actions are at this time. My information this whole month has been focused on dreaming as I spoke about it in the newsletter. ( December newsletter ) The first card I pulled for this reading spoke of the transforming power of dreams. The next spoke of our ability to "Fly", to do the spiritual work required of us and again how we learn about that thru dreaming. We need to learn what dreaming is for each of us as it may be different. It may be waking dreams, sleeping dreams, meditation or images and ideas from when we walk. It may be all of that at the same time. How then do we dream the future and what is specifically required from us. Are we to plan large things or work in small personal ways and what exactly does that mean....My understanding is to be open to doing things that you may never have considered or attempted before to add the energy of Light to this existence, even if they seem somehow insignificant. There is nothing insignificant at this time! Everyone's physical actions that have sprung from their dreaming guidance are needed to create changes, and a different future. The third and fourth cards I drew spoke of Mother Earth's unhappiness and showed her water aspect taking back misused blessings she had given us, while we registered complete lack of understanding of what was happening...........this is NOT divine punishment, but rather the simple effects of our own actions. The fourth was Sleeping Man that, with its channeled information, offered a very clear understanding that, not men, but instead long traditions of patriarchy, which deny the value of feminine beings and their energetic gifts of intuition and emotional sensitivity, are wreaking terrible havoc on this earth and creating humans who are emotionally incomplete, and often destructive beings. The actual quote is as follows: "Sleeping man cannot be allowed to continue his patriarchal dreams or he will anger the Great Mother and Mother Earth beyond redemption. (Irreparable damage will result to our world and ways of life) Refuse to honor this patriarchy's ways." Don't allow it to be in charge. Suffuse it with Light. This is not the same as judgment . It is action FOR the Light rather than action against what must change. "Stand up as individuals in collaboration, doing what is right regardless of how that fits other people's definition of you". Be careful to review your information and let your actions come from your dreaming guidance rather than your re-actions. There is a great difference. Remember that collaboration builds community and webs of connection, friendship and support in our entire world. Be flexible. Let go of your particular idea about what good outcomes are. This is ego based. Outcomes may be things you could have never imagine and quite different than expected, but still be what is needed.
" Dream this new reality, dream it so you can see and manipulate the vision of it. Play with these visualized potentials, reshaping, recoloring, resinging, realigning them to accentuate the brilliance and interesting juxtaposition of their variations. Then bring it into physical reality thru standing up as individuals who reach across differences to collaboratively create it. (Be in) courage, creativity, dance new dances and prepare new food. Hold each other's hands as you construct completely new jobs or life journeys than known before. (We) stand at the edge of a new world if we are brave enough to go there. It's not about a battle of women against men (or this group against that). (All) are so wanted and needed to be part of this great work. It's about the very sad polluting of beautiful and necessary, masculine energy, into something that denigrates and devalues all other energies than its own, especially feminine energies with their beauty and power. (We are being asked to) Become Enlightened Beings, (containers of Light and its information), visited by the 'Eye of God', in your dreaming. Open your channels with Source (so you may receive its information)." A fifth card reminds us of a need for clarity in our information even if we do not understand it. At first reading that would seem to be contradictory but it is not. We have to accept that we do not always understand the information we receive from Source when we are dreaming, and that is not always requisite, but we do need clarity. In order for us to have clarity, we need to be in a state of relaxed focused intent, intending to receive completely any information we are given. In addition, we cannot be in a state of conflict. We need to release all tension and conflict before we attempt to dream. Doing several oxytocin breaths is very helpful. Relax as much as possible then breath in deeply but comfortably and slowly release the breath completely saying "Haaaaaaaa" ( not Ahhh ) aloud or under your breath as you relax completely releasing all emotions and negative energy down thru your feet into the earth. In this more relaxed state, your energy is much more open to receive the information you seek and to hear it clearly. Finally, the sixth card spoke of our relationship with the OLD, old ways of being, ancestors and more, and our communication with all of that. When we become tied to the OLD simply because it has always been so, we lose the original intent of it, even if that was a good intent, and being old is not always an indicator of a good intent or process. In our present moment, we need at times to honor the OLD but may seek to do it in new and different ways, creating new ways of being, of doing, of seeing and hearing and so forth. As we seek to move into a new way of being, it will be helpful if we are able to hold open communication with the old and find bridges that can connect the old with the new so there may be travel from one to the other. As Enlightened Beings, containers of Light and it's information, who now work with our dreaming skills to SEE the New and gain information as to how we can create that reality, we are still part of the all inclusive Whole of Creation, the Flower of Life. We cannot disclaim our DNA connections to any other, nor our connections to the Energy of Creation, our star stuff. We are all one. We cannot amputate parts of ourselves and survive as a Whole People. Dreaming is a tool that can show us how to do the seemingly impossible, to become a new kind of Whole that is more in love, more in light, more balanced in its male and female energies, if we are open to it. Believe and trust. With great gratitude to Goddess Mother for her teachings, to Lynn Andrews and the Sisterhood of the Shields who have guided me in my learnings of how to do this work. This reading has evolved out of the events of the entire month and specifically from segments of two dreams gifted to me. The first dream left me an image of a harlequin- suited jester who was higher than I, riding on something, but facing me thus riding backwards. His suit was brilliant with its orange and metallic gold diamond patterns. I felt very drawn to it and knew it was from the Tarot Deck of cards though I don't work with Tarot at all. The second dream placed me in an old western town watching an aged, white horse, walking backwards parallel to the hitching post rail. He had a dark rectangular opening on his side that seemed to be a doorway to the Universe with some stars there. Add to these dream images, a drawn card that spoke of our possible fears of happiness and a drawn juniper card that spoke to doing cleansing before pioneering new things, then moving into a place of magic, and these are the understandings I have been given. The dreams have combined for me to present yet another heyoka set of information as we move backwards (counter clockwise) around the 4 Directions for the Traditional Medicine Wheel. The thin, old, white horse is walking backwards from this present reality into a new and therefore younger reality for us. He is white, the color my practice traditionally ascribes to the North Direction, the place of Air, a product of our speech, prayers and movement which reaches out to connect us to Spirit. Even more, this beautiful white horse, also holds a portal on his side, which, if we are able to move thru it with our meditation, prayer or dreaming, offers us a shortcut to that space between times where our true purpose, our regenerated true self is most evident to us. We can get there by walking with the horse, beyond ration, backwards into our future, but the dream offers us a short cut to the infinite as well if we are able to see that portal of possibility. Interesting also, my drum, which I use for prayer, journeying and meditation, my dreaming drum, is painted with an image of a white horse called Ariel, and a rider moving thru a dreaming portal. I have not believed in accidents for a long time now. All is one; all is connected. The beautiful Fool, the Jester, the one who rides backwards on the backwards walking horse is in reality, pure potential, the zero place between coming and going, conceiving and creating. 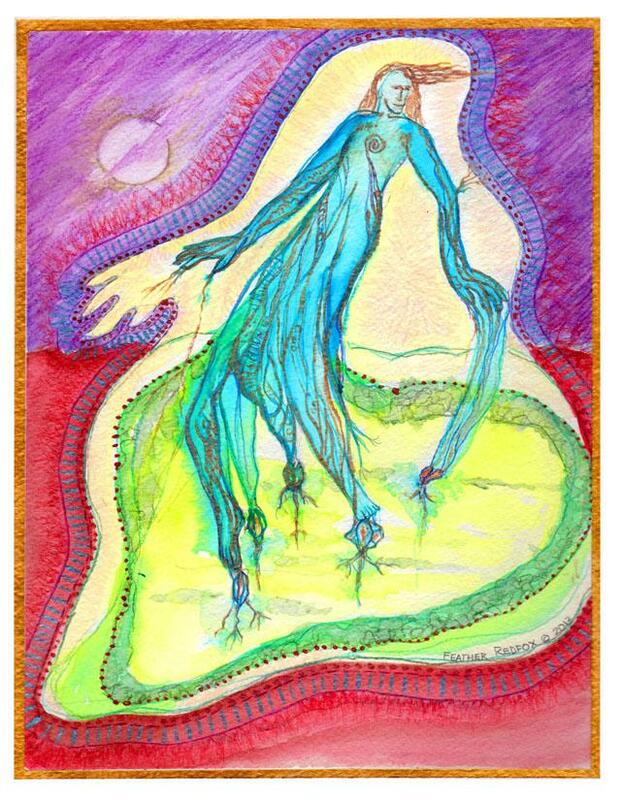 This Jester shows us Source or God energy at the moment just before it creates in all its infinite potential as explained by James Rioux, CPTR on the American Tarot Site listed above. This Jester represents us in all our pure potential and is beautifully different in his gold and orange diamonds representing the gold of highest possibility with second chakra orange of courageous, empowered optimism. The passion energy of the orange color and second chakra energy encourages our passion on all levels and helps us too to be empowered. It's energy aids us in releasing our distrust and superficiality so we can move beyond our present. Neil Donald Walsh says, "we love what is AND we choose again". We move forward, upward, onward or we become old, stale and our souls shrivel. So we are being called as we move toward 12/2012 to move, to grow our new, more true soul selves in whatever ways we find work for us. We are being prompted to live beyond the possible, to move beyond the rational to act our potential..... not our age or social status, to DREAM the realities we so need in our hearts and live toward them rather than sitting in the same life chair that has become so familiar to us. WHO ARE YOU....REALLY? What is one new thing that you can do to become the higher you you have always dreamed of?